If Brian Wood were a high school teacher, he’d be the one any kid could turn to. Wood is at his best when he’s writing about rebellious youth, and just plain rebels. That’s why it’s brilliant to have him on this unusual comic book project. 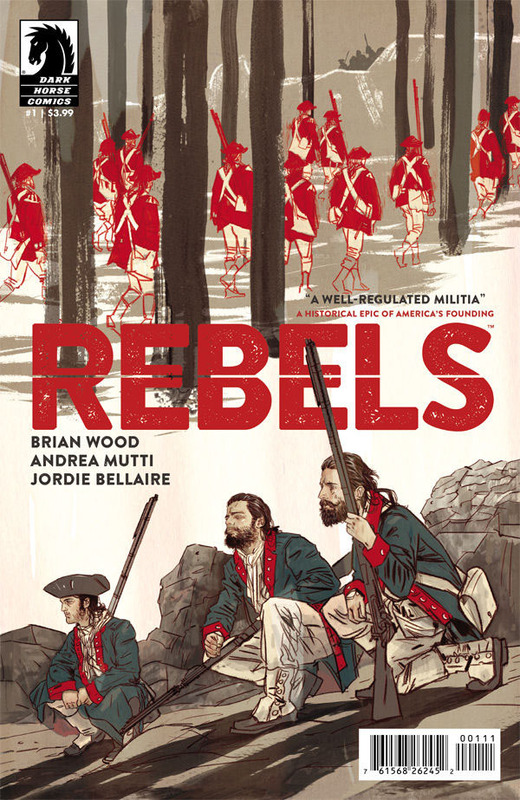 For those who read comic books, when was the last time you read a compelling comic book series set in the American Revolution. Never? Well, here it is. Wood loves to get his readers deep into the story. He succeeds here as we can’t help but root for Seth, a boy with a very distant father. And then nothing is ever the same again. It turns out that his old man is keenly interested in killing redcoats. And he means to teach his son all he knows. And, before it’s too late, he might even get to express his love for his son. In the first issue of “Rebels,” we begin a six-chapter arc, “A Well-Regulated Militia.” It is all about the education of one Seth Abbott. Wood does a fine job of laying out Seth’s journey as he, lucky for everyone around him, finds his voice. In time, Seth becomes a man who matters and who can contribute to the rebel cause. Art bt Andrea Mutti perfectly compliments Wood’s script with authentic settings and characters. It’s very important to Wood to get you inside the story and he certainly succeeds with that. Yes, if Brian Wood were a high school teacher, he’d be more concerned with a student understanding a subject than whether he or she got an A. So far, “Rebels” has got an A and it looks like it will maintain it. “Rebels #1” is available as of April 8. For more details, visit our friends at Dark Horse Comics right here.